A defensive fighting position (DFP) is a type of earthwork constructed in a military context, generally large enough to accommodate anything from one man to a small number of soldiers. A foxhole is one type of defensive strategic position. It is a "small pit used for cover, usually for one or two men, and so constructed that the occupants can effectively fire from it." It is known more commonly within United States Army slang as a "fighting position" or as a "ranger grave". 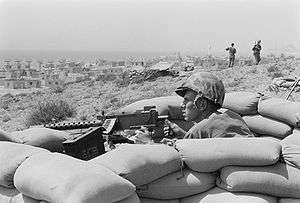 It is known as a "fighting hole" in the United States Marine Corps, a "Gun-Pit" in Australian Army terminology, and a "fighting pit" in the New Zealand Army. 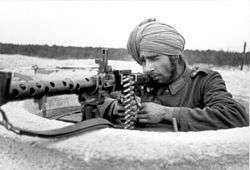 In British and Canadian military argot it equates to a range of terms including slit trench, or fire trench (a trench deep enough for a man to stand in), a sangar (sandbagged fire position above ground) or shell scrape (a shallow depression that affords protection in the prone position), or simply—but less accurately—as a "trench". During the American Civil War the term "rifle pit" was recognized by both U.S. Army and Confederate Army forces. During the fighting in North Africa (1942-43), U.S. forces employed the slit trench. This was a very shallow excavation allowing one man to lie horizontally while shielding his body from nearby shell bursts and small arms fire. The slit trench soon proved inadequate in this role, as the few inches of dirt above the soldier's body could often be penetrated by bullets or shell fragments. It also exposed the user to assault by enemy tanks, which could crush the man inside a shallow slit trench by driving into it, then making a simple half-turn. After the Battle of Kasserine Pass (early 1943), U.S. troops increasingly adopted the modern foxhole, a vertical, bottle-shaped hole that allowed a soldier to stand and fight with head and shoulders exposed. The foxhole widened near the bottom to allow a soldier to crouch down while under intense artillery fire or tank attack. Foxholes could be enlarged to two-soldier fighting positions, as well as excavated with firing steps for crew-served weapons or sumps for water drainage or live enemy grenade disposal. The Germans used hardened fortifications in North Africa and later in other fortifications, such as the Atlantic Wall, that were in essence foxholes made from concrete. The Germans knew them officially as Ringstände; the Allies called them "Tobruks" because they had first encountered the structures during the fighting in Africa. 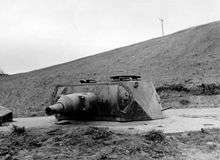 Frequently, the Germans put a turret from an obsolete French or German tank on the foxhole. This gave the Tobruk enhanced firepower and the gunner protection from shrapnel and small arms. Modern militaries publish and distribute elaborate field manuals for the proper construction of DFPs in stages. Initially, a shallow "shell scrape" is dug, much like a very shallow grave, which provides very limited protection. Each stage develops the fighting position, gradually increasing its effectiveness, while always maintaining functionality. In this way, a soldier can improve the position over time, while being able to stop at any time and use the position in a fight. Typically, a DFP is a pit dug deep enough to stand in, with only the head exposed, and a small step at the bottom, called a fire step, that allows the soldier to crouch into to avoid fire and tank treads. The fire step usually slopes down into a deeper narrow slit called a grenade sump at the bottom to allow for live grenades to be kicked in to minimize frag damage. When possible, DFPs are revetted with corrugated iron, star pickets and wire or local substitutes. Ideally, the revetting will also be dug in below ground level so as to minimise damage from fire and tank tracks. The revetting helps the DFP resist cave in from near misses from artillery or mortars and tank tracks. Time permitting, DFPs can be enlarged to allow a machine gun crew and ammunition to be protected, as well as additional overhead cover via timbers. In training, DFPs are usually dug by hand or in some cases by mechanical trench diggers. On operations, explosives, especially shaped charges ("beehives"), may be used to increase the speed of development. Developing and maintaining DFPs is a constant and ongoing task for soldiers deployed in combat areas. For this reason, in some armies, infantry is referred to as "gravel technicians", as they spend so much time digging. Because of the large expenditure in effort and materials required to build a DFP, it is important to ensure that the DFP is correctly sited. In order to site the DFP, the officer in charge ("OIC") should view the ground from the same level that the intended user's weapons will be sighted from. Normally, the OIC will need to lie on his belly to obtain the required perspective. This ensures that the position will be able to cover the desired sector. ↑ Bundessprachenamt. Militärisches Studienglossar. Englisch. Teil I, A-K. Hürth, 2001, p. 580. ↑ Brown, Albert S. "Anzio: Jan-May 1944". World War II Memories of Staff Sergeant Albert S. Brown. Dogface Soldiers Memoirs. 1 2 3 Westrate, Edwin V. (1944). Forward Observer. New York City: Stratford Press. pp. 46–47.